Just seen this. Thanks for the info, diederik. Anyone been to Folk, Oli Spencer etc? I went down, certaibly worth a visit. Folk stuff isn't that cheap anymore. Although the mark downs on jackets seem reasonable. Folk sale same as every time, similar pricing, £40 shirts, ymc knits £30-50, lots of stock as usual. They did have a few pairs LVCs, £70-90, had a couple eastman jackets, couple sheepskins and 1 A1(i think) in brown horsehide size 44 for £195, gutted too big. Yeah an ok sale, decent stock. YMC the best bits I'd say, some good jackets (those leathers were nice) and bags and stuff in there. Owlix wrote: Thanks Razor for posting the Joseph sale. I'll be stocking up on Christmas presents. No worries, did you go in the end - I was in London but didn't even think about going to this. Still pretty expensive to be honest and not a great range of sizes for womenswear so I didn't actually pick anything up. They did have some interesting menswear bits though, random stuff from White Mountaineering, Casely-Hayford, Ann D and Junya for decent prices. Reckon it'll be better than the one they had a few years back? That was a disgrace. ^ Don't see how it could be worse! Will probably have a look at lunchtime, look forward to morning reports. Might be easy to walk into, as so much else on. 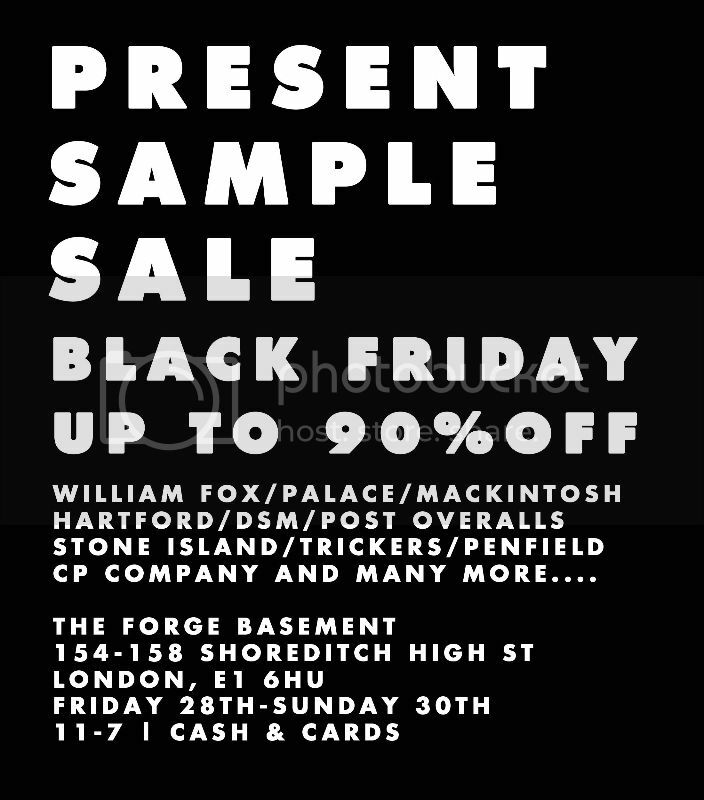 Always wondered why sample sales charge for entry. It's the most outrageous cover charge when you think about it. Always assumed it was a licence thing - you need to charge as otherwise it's as if you've opened a temporary shop? A lot of sales give the charge away to charity.